Wednesday was a beautiful day for a hike in Palmer Park. We left home around 10 a.m. to begin our 4 hour hike up and around the top of the park and back down again. 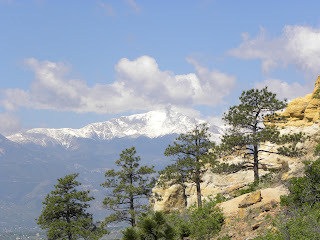 Just minutes from our house by foot, Palmer Park is about 500 acres of beautiful views and challenging mountain-like trails. It is frequented by mountain bikers, hikers, birders and horse-back riders. Pikes Peak was in the distance as we went around the bend. 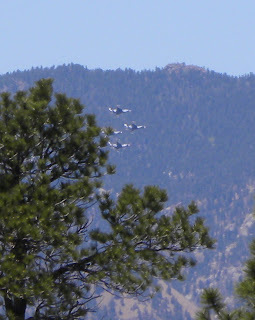 Since Wednesday was the Air Force Graduation, we were treated to an aerial display by the Thunderbirds. Who says bees are endangered? 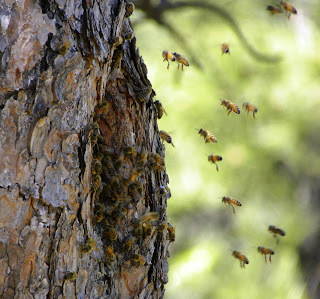 This was a busy hive! 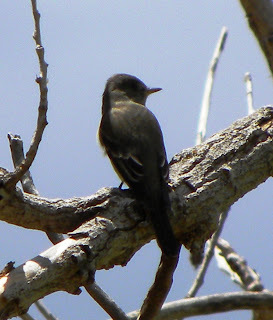 This is probably the same Western Wood Pewee we saw the other day. 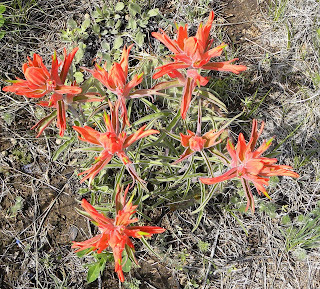 There is a large, flat prairie at the top of the trail and the wild-flowers were beautiful in the sunlight. I'm working on my close-up shots - but I don't have the technique perfected yet. I need lots more practice. The swifts and swallows were flying everywhere - but they are impossible to photograph as they move so quickly and erratically - so it was a real treat to get this picture and even more so when I found out the bird is a Violet-green Swallow. 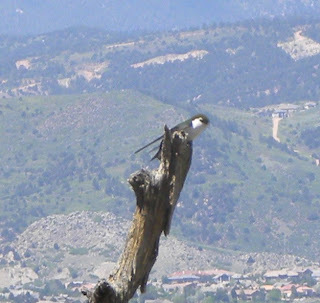 They are the only swallows in the area to have white above the eye. I had never identified one before. 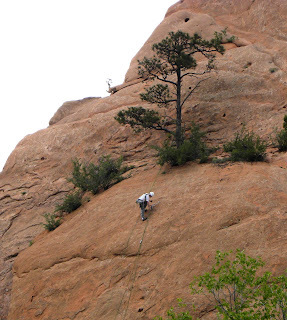 Colorado Springs, along with other parts of the west are famous for red rocks. 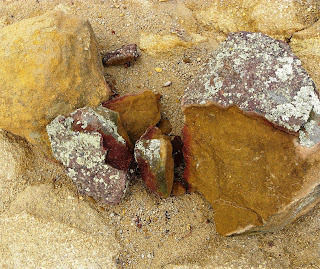 The color comes from the high iron content. 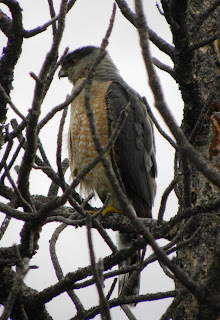 I'm pretty sure this is a Cooper's Hawk. Look at the dark head, grey neck, red eye and banded tail. 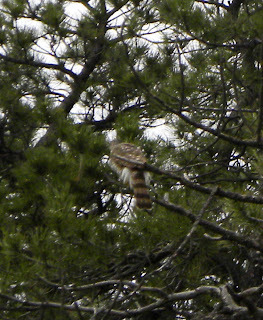 This is a different Cooper's Hawk - and a lousy picture - but it shows the bands on the tail better than in the last picture. We don't see too many hawks in the park - maybe one every other day - so we were pleased to spot two in the same day. On Thursday we decided to hike somewhere new and went to Red Rocks Canyon - 787 acres of open space between Manitou and Colorado Springs, just south of Highway 24. The property features rock formations comparable to the Garden of the Gods. We packed a picnic lunch, lots of water, our binoculars and cameras and headed out. 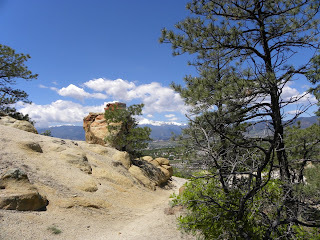 We hiked one of the more difficult trails - around four and 1/2 miles with an elevation of over 600 feet. There are over 13 miles of trails, so we will return again. 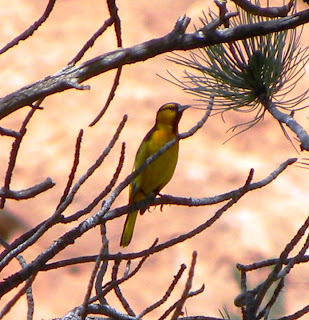 This is a young male Bullock's Oriole and is more yellow than the orange adults. 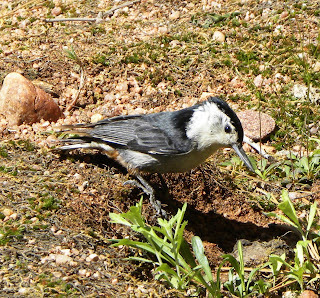 We identified two White-breasted Nuthatches, one in the thick pines at the top of the trail and this one near the end of the trail. 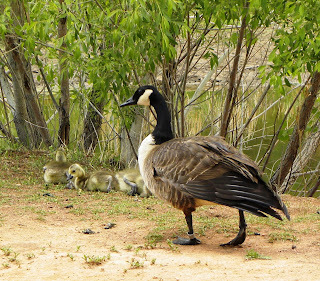 There is a small lake, home to a family of Canadian Geese. All of the adult geese were banded. 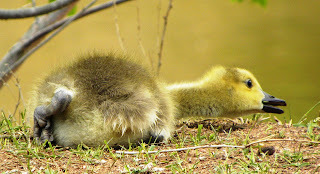 I suspect this cute little guy will be banded in the near future - but for now he is just learning to peck for food and use his legs. The red rock formations in the canyon are a haven for rock climbers. We saw several groups with full gear and what seemed to be instructors teaching them to climb. 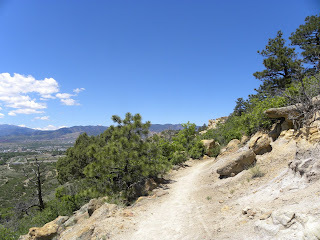 Maybe sometime soon we will try Barr Trail - the trail that goes to the top of Pikes Peak. My father climbed to the top when he was a teacher at Colorado College in the early part of the 20th century - before he was called to serve in World War I. At age 62, I probably won't make it to the top - or even close - but you never know if you don't try!